Carved and assembled wall piece, made from sycamore and ash. The straw bale pyramid, and, below it, the swan, half timbered wall pattern, and Chiltern watercress are all elements made from sketches collected for inclusion in "The Buckinghamshire Clock", installed in the County Museum, Aylesbury. Painted in watercolour, finished with acrylic varnish. This piece was made from designs and sketches I gathered when creating the Buckinghamshire Clock in the County Museum, Aylesbury, installed 2000. 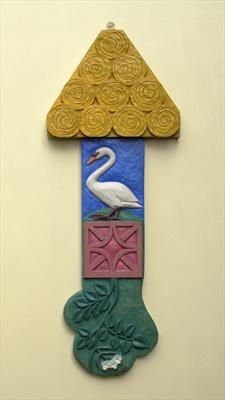 The top element, carved from sycamore, is a pyramid of cylindrical hay/straw bales, the lower element, carved in ash, comprises a swan, the county mascot, standing above a bit of the half-timbered wall of Woburn Sands Railway Station. Below this the piece ends with a tail of watercress, referencing the chalk streams of the Chilterns.